Navigating the rules of how to share sponsored content on Instagram can be tricky. If you’re an influencer, you don’t have a boss who can show you the ropes, and the internet is a minefield with different websites telling you different things. It's little wonder that so many influencers aren’t declaring their ad’s correctly. Thankfully, the ASA have recently shared concise guidelines that clearly state how to share adverts. If you haven’t had the chance to read the 20 page document, we’ve summed up the main points here for you. If you haven’t come across them before, the ASA are the Advertising Standards Authority in the U.K. They basically ensure that all advertising across all forms of media meets the rules that they set. If a member of the public is unhappy with an advert on TV or thinks that an ad on Instagram hasn’t been declared correctly, they can make a complaint to the ASA who will investigate and act accordingly. Whalar Creator Hannah Argyle demonstrates how she uses #ad. For influencers, there are two main ways in which your content can count as advertising: paid for ad space or your own advertising. Paid for ad space is pretty self-explanatory; this covers banner ads on your blog or sponsored posts on social media. Your own advertising is something that you might not have previously considered; if you are posting about your own products or services that you sell, this counts as advertising. Then there is affiliate marketing. This is when a business rewards someone for bringing in traffic or sales. For example, if you’re a fashion blogger and you share links to recommended products on your Instagram Stories that you are rewarded for with a percentage of the sales generated. Affiliate links need to be clearly labelled as such, even if it’s just a swipe-up in your Stories that will only be live for 24 hours. So, what makes your content an #ad? Contrary to popular belief, it isn’t just content that you are getting paid actual money for. Gifted products count as adverts too – if the brand has editorial control over what you post. Also, somewhat confusingly, the editorial control has to be present even when you are being paid for it to technically count as an advert. Basically, if a brand has paid you in any way (money or freebies) and they have had editorial control over your content, it’s an ad. Editorial control doesn’t just mean that they have dictated what you should post or approved your images, it could also mean that the brand have supplied you with a specific hashtag to use or that they have stipulated how many images you should share for a collaboration. Consumer Protection Legislation still applies if there has been some sort of payment (money, freebies or a product loan) even if there has been no control over the content. This is enforced by the CMA (Competition & Markets Authority) and counts as ‘sponsorship’ rather than ‘advertising’. To be safe, it’s best to declare any content that includes payment or editorial control as an ad. PSA: Sometimes you’ve gotta throw on a tiara crown and remind them who the f*ck they’re dealing with 💁‍♀️ #YasKween #SuperDog #Vitabiotics @Vitabiotics ——————————— #Ad - Want to be a superhero dog too? Then try SuperDog. With 26 vital nutrients these vitamins contribute to health and overall well being. Maintaining good skin and coat condition and a healthy nervous system. Even dogs like Dolly Pawton have to declare their #ads! - Submitting guidelines for the content of images, videos, etc. How should I declare my ads to meet ASA guidelines? The main point to consider when creating content in partnership with a brand is that ads ‘must be obviously identifiable as such’. The people viewing your ad should be able to immediately identify that it is an advertisement before clicking on or engaging with the content. It should be obvious that it is an ad, which means that hiding a #ad in your hashtags is not sufficient. When creating a sponsored blog post or Instagram post, be aware that people need to know that it is an ad before they click on it or engage with it. If they have to click into your blog post to read the content, they need to know it’s an ad before doing this. Likewise, with an Instagram post, you need to state at the beginning of your caption that it is an advert, before people read on. To be sure that you are labelling your sponsored content correctly, it is advisable to use the terms Ad, Advert, Advertisement or Advertising. Other forms of identification (such as Sponsored, In Association With or just @ the brand) are usually not acceptable. Kika Kutova shows you can still maintain your creativity while declaring an #Ad! - Is it immediately obvious that your content is an ad? - Have you used the correct word to identify the content as an ad? - Do people know it’s an ad before they click on or engage with the content? - Is the identification that the content is an ad displayed in a prominent position? What if I’m promoting my own products or services? Something which might be new or confusing to those reading the ASA guidelines for the first time is that when you are promoting your own products or services, this also counts as an ad. This could include promoting your own e-book, online course, retreat, or even your own blog posts. As long as it is clear that you are talking about your own products or services, it is usually good enough. When promoting your own products or services, and when participating in affiliate marketing, there are other guidelines that you need to be aware of. It’s a good idea to read over all of the ASA’s rules to ensure that you’re up to date with the rules covering everything from making claims that you need to be able to back up to running your own giveaways. 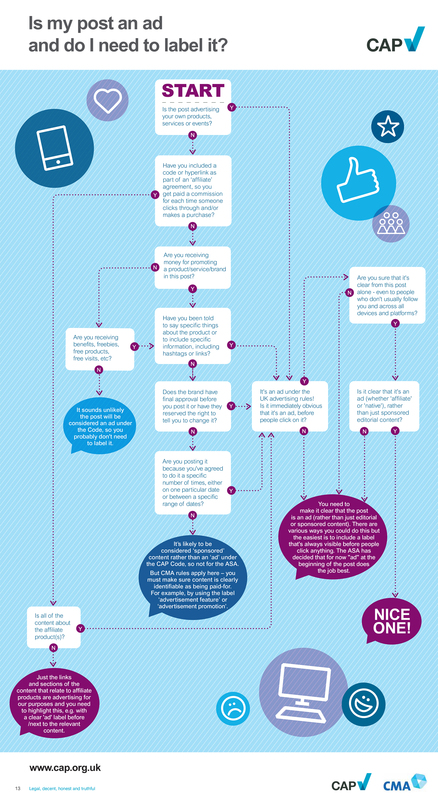 If you’re still unsure about when to declare that your content is an ad, or how to declare it, use this handy flowchart (see below) every time you post content that may be considered as advertising. If in doubt, label it as an #ad, just to be safe!